Canvas has been undergoing some dramatic development and improvements since we were last together on campus. What follows is a non-comprehensive run-down of the major changes to be aware of. The menu to change which grading period you’re looking at is on the right, right over the list of student names. It will remember the last setting that you used, and tends to default to “intelligent” settings (i.e. the current grading window). If you view a particular grading period, Canvas will calculate averages for your assignment groups (a.k.a “categories”) and totals within that grading period. If you change the view to All Grading Periods, assignment groups and totals will be averaged over the whole year. More details about the Gradebook and grading periods is available in the Canvas Guides. You can create a letter-graded assignment on the front page of your course by clicking the Go button next to the SM Letter Assignment drop-down menu. There’s more information and a tutorial on how to use this tool at the Help Desk. This is something that we built in-house, so if you would like to see improvements or changes, talk with Seth about your vision. A course with many sections (and teachers) could be pulled together into one umbrella course so that the teaching team can share and re-use common assignments. A teacher could develop individualized assignments for different students (or groups of students) to meet their specific needs. A teacher could create an alternate pathway through a unit for a student in need of either additional support or enrichment. Students can only see assignments that have been assigned to them (either individually or as a section). They can’t see assignments that have not been assigned to them. Teachers can see all assignments (for, one presumes, obvious reasons). In a course with many teachers and many different assignments, it may be undesirable to bring all of the sections together under a single umbrella for that reason (imagine what your gradebook could look like). However, if most of the assignments are shared across all sections, it may be simply wiser to enforce a naming scheme (e.g. all assignments that start “Battis-Red” are for my Red Block section). If students have uploaded a Word document for this assignment and you’ve marked it up in Speed Grader, those annotations will now automatically open up for a student when they get to the assignment feedback page. If you have used a rubric to assess the assignment, that rubric will automatically open for a student when they get to the assignment feedback page. If you would like directions for students about how to find this feedback, it’s available online in the Canvas Guides. For those of you intrigued by the possibilities of video annotation, it’s worth considering using VoiceThread as a fairly intuitive way for both students and teachers to build this annotation. The Patterson Blended Learning Group experimented with it quite a bit last year, and it is now available for all of us to use, integrated with Canvas. For more about what VoiceThread is, check out their website. (You don’t need to register — when you create VoiceThread assignments through Canvas, it will automatically connect you in to the St. Mark’s account). For more about how to use VoiceThread within Canvas, check out this article on Help Desk. If you would like to sit and think about how to use this (or any other blended or online pedagogic approach), chat with Jeniene or Seth. Last spring, Canvas rolled out a (massively-improved) support community which includes both discussion boards to seek help from both Canvas staff and users at other institutions, as well as extensive documentation about how to use Canvas (beyond the scope of the Canvas Training course). I strongly encourage you to participate in this community — the feature voting alone may be enough of a draw. And we have already seen the impact of that feature voting in the Canvas Studio, where they track the development of new tools. The Canvas Guides are a fantastic resource — and not just for us as users, but for us as teachers: we can simply share the directions for how to do something directly with our students (and help them to become more self-sufficient by pointing them towards further resources). If you post something, go ahead and share it with me (Seth), so that I can help advocate for you! 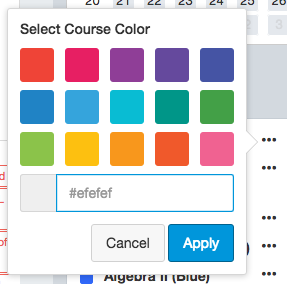 You can now customize your course colors. We are still working to make sure that everyone’s initial setting for their color blocks matches the color of the block (for, I presume, obvious reasons), but you are free to choose a custom color if you would prefer. It’s not (yet) well-documented, but you can change the color for a course by clicking the ellipsis next to the course name in your calendar and choosing a new color. And you may want a nice hex color picker (that’s what that #efefef is — a hex color). The resource menu is in the process of being re-organized to better match both the proliferation of new information from the summer (yay to all of us for working so hard to provide so much new and improved documentation!) and how it was actually used this past year. It should get easier to use, rather than more extensive. The Grading Analytics dashboard for individual courses continues to be updated, but there is also now a more general Grading Analytics dashboard for department chairs at the account level. Cruise over to your department in the Courses menu and look for Grading Analytics in the left-hand sidebar. An improved Advisor Dashboard, accessible from within your Advisory course. By the end of the week, the dashboard will be showing up in Advisory courses, but the only information available will be the logins to observe your advisees. The hope (which springs eternal) is that this dashboard will provide a quick overview of your advisee’s progress relative to their various courses (i.e. the “how proud/worried should I be” visualization). Improvements in the Grading Analytics displays to make them a little less overwhelming (and hopefully more aesthetically-pleasing), while simultaneously modernizing some of their technical underpinnings (that means nothing to you, but the world to me). An individualized assessment calendar — the ability to look at when your students have assessments scheduled, so that you can schedule your own thoughtfully. This is about 30% complete, and will probably show up before the end of the first window and definitely before the end of semester crunch. Why can’t I see my course in Canvas? This is mostly about how your “favorites” are set up, but may also be a glitch — if you follow the directions at the link and it doesn’t work, you’re in glitch territory and should tell me right away (including specifics, like which course). Not so much an issue as a recurring reminder: if you would like your sections merged into a single umbrella course, shoot me an email to let me know — it’s fast, but needs to be done by an account admin (me). And it works best if it happens before assignments start getting assigned and graded! Why can’t I see the grades that I just entered? This was a known bug in Canvas that affected people who use differentiated assignments within grading periods (that is, assignments assigned to only a few of your students or a section, not “Everyone”). Turns out, when looking at these assignments in your gradebook you couldn’t see the grades that you just entered. Which induced some panic. But, if you switched to the “All Grading Periods” view (top left, over the list of students), all is revealed. Resolved October 17, 2015. This entry was posted in Faculty and tagged Canvas. SUPER excited about the coming attractions!